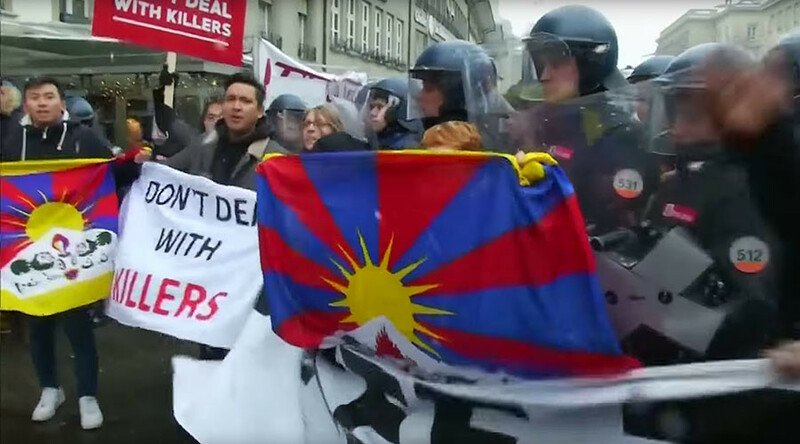 Swiss Police have detained 32 pro-Tibet activists, including one man trying to set himself on fire, protesting against a state visit by Chinese President Xi Jinping. Several protesters near a security zone set up ahead of Xi Jinping’s visit failed to comply with police instructions, Reuters reports. Police in riot control gear arrested protesters and also reportedly prevented one man from setting himself on fire. Security measures and a two-hour protest time limit were put in place in central Bern ahead of Jinping’s visit, due to the sensitive issue of Tibet. In 1999, demonstrators took to the rooftops overlooking the Swiss parliament with pro-Tibetan banners during a visit by then-President of China Jiang Zemin, and tried to throw eggs at the Chinese delegation. “The situation inside Tibet is getting worse day by day. Our people are being oppressed, our people are being imprisoned,” Tibetan Youth Association in Europe spokeswoman Migmar Dhakyel told Reuters on Monday. “We are really concerned how our government, our own government treats us… doesn’t permit us to demonstrate,” she said. Organizers said the demonstration attracted between 700 and 800 protesters and passed peacefully, though some participants refused identity checks. The protest took place one day after Beijing appointed a new governor for its southwest Tibet Autonomous Region. Qi Zhala, 58, the region’s Communist Party vice-secretary, replaced Luosang Jiangcun, who had been governing Tibet since 2013. China gained control over Tibet in 1951 following the signing of the Seventeen Point Agreement between Beijing and Tibetan leaders. The deal gave Beijing control over the region’s external affairs and security issues. China maintains that the region has been part of its territory for centuries, a claim disputed by Tibetan secessionist movements for decades.